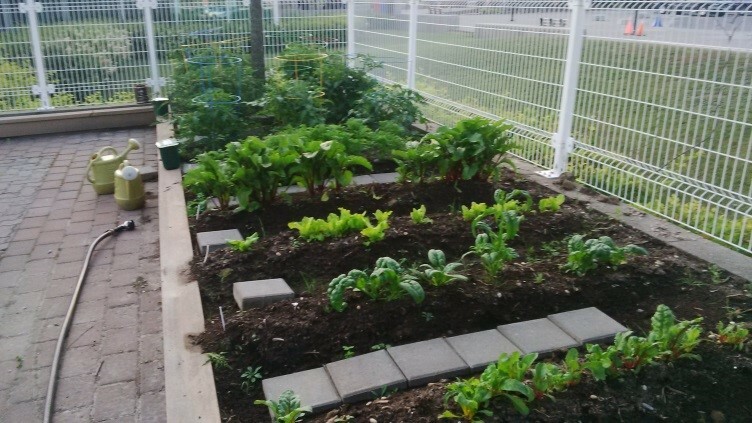 Managing a community garden in a government environment makes sense. Public employees work to help Canadians, and a community garden is an extension of that. The Sustainable Development Committee at the Sudbury Tax Services Office started a vegetable garden in the spring of 2014 and donated their harvest to the Sudbury Blue Door Soup Kitchen. The garden was maintained by employees on their personal time and was a collaborative effort by volunteers. They included employees with lots of gardening and landscaping experience, to those who did not know what a zucchini plant looks like. The enthusiastic volunteers offered their skills and experience in weeding, watering, clearing the garden, laying the seeds, and picking the produce. Those with more years of experience answered questions and guided activities, helping to make the entire process run smoothly. The garden was planted with donated seeds and seedlings and was tilled often to reduce the chance of insect or worm infestations. In 2015, the Sustainable Development Committee and their fellow gardeners worked to customize the garden to the needs of the Blue Door Soup Kitchen. Support was obtained by the PSAC Social Justice Fund to purchase fresh soil and some implements to expand the plot to be three times bigger. Moreover, a scale was purchased to weigh the produce headed to the Blue Door Soup Kitchen. The garden will continue to expand, as interest, curiosity, and the volunteer base grow. Thanks to Audrey Lalonde, for her article, “Our Community Garden."